In most cases a drain snake / drain spindle is a simple and low-cost method to clear clogged drains. If you have already tried all household remedies you may consider to grab a drain snake for cleaning a drain or clogged toilet. In this article we will explain how a drain snake works and how to snake a drain. The drain snake is very environmentally friendly as you can use it several times and you can clear drains and toilets without using chemicals. So if you consider to call a plumber and the plunger did not work you may use a drain snake first to go for the blockage in your drain. How does a drain snake / auger work? Usually there is a wide variety of reasons you may grab a drain snake or drain auger. The most common ones are seriously clogged drains, pipes or toilets. If a plunger does not do its job the drain snake is the next option. 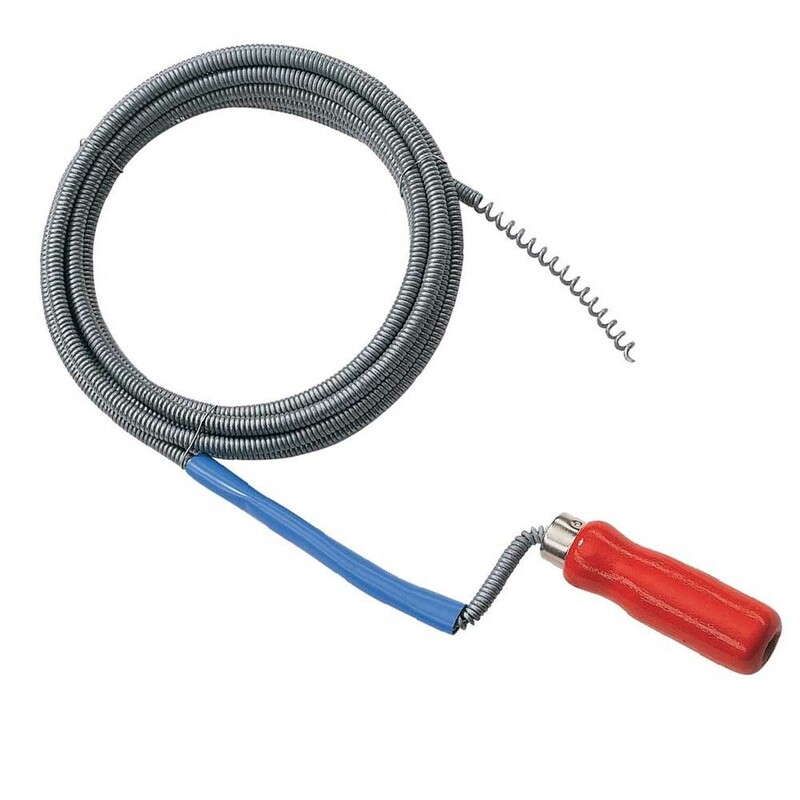 Most of the drain snakes are made out of tempered spring steel that will make the snake flexible, tremendously resistant to breaking and very strong. The advantages of a drain snake are that it is very flexible and that you will be able to maneuver around several pipe or drain bends to reach out to the clogg. Usually drain snakes also have a crank handle that moves the snake with its boring head down the drain. Have a closer look at the crank handle an chose a non-slip handle if available – it makes life easier. These drain snakes (or drain augers) as shown above are specially made for small drains like the ones in kitchen sinks or bathtubs. Drain snakes available in DIY stores and supermarkets vary a lot in terms of lenght and thickness. Before buying a drain snake make sure to gain a better understanding of the drains in your household and only buy a drain snake that fits into most of the drains and is long enough to reach down to the pipes in the wall etc. How to snake a drain with a drain spindle? First of all use a plunger to remove unnecessary material floating around in your drain. And also try to clean the s- or p-trap before using the drain snake. Get the snake / auger, a bucket and potentially some cleaning gloves you can put on your hands. Also have some toilet paper or tea towels to clean up afterwards or while snaking the drain. If you have a a mesh, drain screen or hair trap or something related covering your sink drain please remove this or any other stuff that prevents the snake to find its way into the drain. Now push the snake wire / cable deeply into the drain. Do not forget to turn the crank handle while putting the wire into the drain. This will make life much easier. Push the wire / cable as far in the clogged drain until you reach the clog. So if you feel resistance on the cable in the pipe and only stop pushing if you are sure you hit the clog. Sometimes its hard to bend the wire around the curves in the drain – keep this in mind. When you reached the clog keep on turning the crank handle in the same direction. Slowly pull the wire / cable back and see if you captured a piece of the clog. Clean the snake after pulling it out to assure best effort the nex time you put it back in. If you fully hooked the clog slowly pull out the cable again and try not to loose the clog on the way back up. Repeat this step until most of the clog is removed. To test if the drain is cleared and the clog is removed run some (hot) water through the drain and see what happens. If the water moves quickly through the drain all should be fine. If its still moving slowly please repeat step 7 again (and maybe again). Please feel free to share this article or leave a comment with your thoughts. Did you know that a drain snake might also help to remove bad odor from smelly drains? Using a drain snake might push the clog deeper into the drain or even down the pipe in the wall. So please use the snake carefully and make yourself comfortable how to use it.